Before my oldest son was born, my wife and I had an epic argument on what we should name him. She wanted “Trey.” I wanted him named after my father and me. Hatfield vs. McCoys? Spartans vs. Persians? Those were mere skirmishes compared to the fight that my wife and I had over what to call our firstborn. After spending another long, uncomfortable night on our hideaway bed, I compromised with her. We ended up putting Peter Francis Schopen III on his birth certificate, but we call him Trey (meaning The Third). Of course, it has been a legal nightmare with school, swim teams, colleges, etc. I should’ve left that one alone. The poor kid will be proving his identity for the rest of his life. But it does demonstrate how names are incredibly important. Would you cheer as lustily for the Green Bay Rainbows? (Okay, that’s a bad example because, seriously, what the heck is a Packer?) How about the Notre Dame Praying Nuns? Or the Boston Purple Sox? Names can be the first and most important impression we make. John Wayne’s real name was Marion Morrison. Would you call anyone named Marion “The Duke”? No way! In the late 1990s and early 2000s, companies paid huge sums of money to buy website names and addresses. Now, it’s email addresses and Twitter accounts. So when you begin your new business, what you call your company can be just as important as what Kim and Kanye name their next kid. A funny, but true story involves my mother and her married name. Mom’s maiden name is “Little.” My step-grandmother’s maiden name is “Short.” My stepdad’s brother’s wife’s maiden name is “Small.” In other words, all of the men in my stepdad’s family married women with tiny names. And what, do you query, is my stepdad’s last name? It’s “Ray” — just three letters, which means the women all married men with an even “tinier” name. 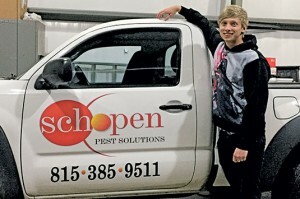 Schopen Pest Solutions was originally going to be called Cardinal Pest Solutions, or CPS for short. The cardinal is the state bird of Illinois, and I personally think it is a beautiful animal. But after hours and hours of arguing with myself, I finally decided I wanted to promote me, not the state bird. Picking the logo was even harder. I had an artist develop more than 20 renderings for me before I chose a logo that actually uses my name as part of the artwork. Of course, when I left my dad’s company, he told me I should call my company Benedict Arnold Pest Control. Ouch! People are very sensitive to the word kill these days, or anything associated with killing. Do you remember the Washington Bullets? If you were born after 1997, you probably don’t. They changed to the Washington Wizards in 1998 because of public outcry. I still love the word exterminator, but some individuals think of it as an outdated term. Try not to name your company after a city or state, because it’s harder to trademark a public word. 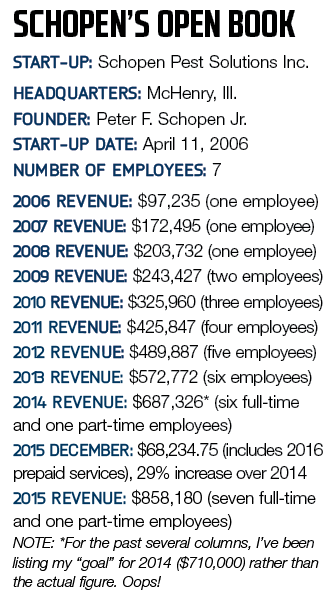 What’s to stop 10 people from starting up “YOURTOWNHERE Pest Control”? Do you really want that sort of legal fight? Try to avoid sounding like another company in your region. That was the main reason I stayed away from “Cardinal.” In fact, at least two pest management companies in the Eastern half of the United States are called Cardinal. Avoid picking a name that could someday offend someone. Right or wrong, people are sensitive to certain words. “Spider Stompers” might sound catchy now, but in five years will people be offended by the word “stomp,” or associate it with a violent crime like curb stomping? Naming your company should cause you to lose sleep at night. This is your baby — and it’s just like the fight my wife and I had nearly 18 years ago when naming our son. It is important, so treat your decision with the respect that it deserves. love-struck girl. Try naming a pest management company sometime.